Perfect wedding photos will put a smile on the married couple’s faces even years later and bring back powerful emotions from their big day. LAPIXA will show you trends and creative ideas of how you can capture the perfect wedding photos for your clients. Many couples wish for an engagement shooting a few months prior to their wedding. The engagement shooting is a great opportunity for the photographer and the couple to meet each other before their big day. Additionally, wishes and ideas for the couple’s wedding photos can be talked about, so that the engagement shooting also serves as a pretty good test for the most important day in the couple’s life. Another advantage is that the images can be used for wedding invitations and save the date cards. You as the wedding photographer can use this meeting to internalize the couple and their concepts for wedding photos as well as introducing your own ideas from past experience. A list with “do’s and don’ts” will help to perfectly capture the couple’s wedding day. This US trend is picking up internationally as well: A bride boudoir photoshoot, which takes place before the wedding, just like the engagement shooting. This special and original photoshoot is the bride’s gift for her groom: She’s captured in her bridal lingerie. Wedding details such as elements of the decoration theme, flowers, or the engagement ring are integrated. As their wedding photographer, you’re gifting the couple a unique and intimate memory. But also after the wedding, a boudoir photoshoot is a loving surprise for the husband. When you first meet with the bride, give her a few ideas – without letting the groom know of course. If you want to get creative as a wedding photographer, you proclaim fine art photography. With fine art photography, you don’t follow a strict photo concept, but collect impressions, inspirations and experiences of the wedding, which later come together as a synthesis of art with the result: A perfect production of wedding photos. Stick to your aesthetic vision and personal style. This is how you’ll capture every wedding in a very special and unique way and create a work for eternity – for the couple. Nothing is worse than intrusive flashing when the couple says “I do” or during the emotional speech of the bride’s father. As a wedding photographer, it’s your mission to accompany the whole wedding day and capture the atmosphere with every detail. This calls for tact, empathy and the right timing. Your best shots are candids that come about without staged poses. 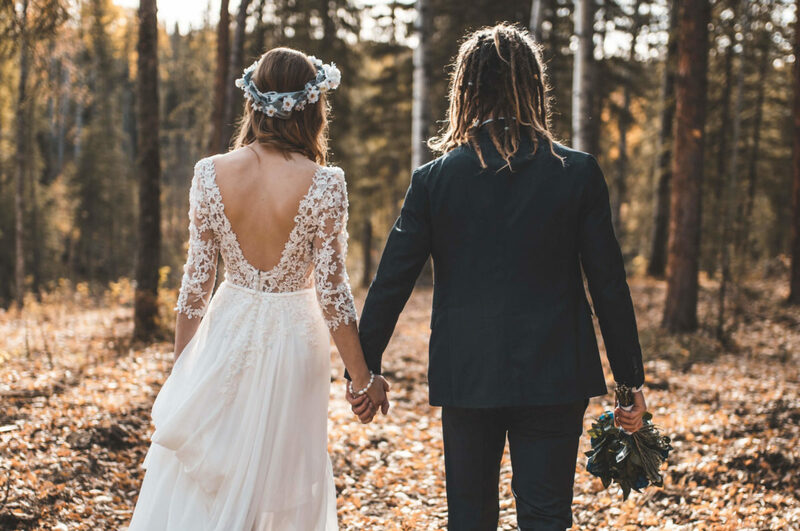 Pay attention to the wedding couple and their guests, but don’t forget the seemingly minor details: fine stitching on the bride’s dress, a strong hug of her best friend or perfectly arranged decoration – these snapshots that will ensure goosebumps when you look at them later. A guarantee for success that distinguishes an average wedding photographer from a master is the perfect lighting mood. Sometimes, moving only a few inches to the right or left will make all the difference; therefore, always keep an eye on the lighting. Don’t shy away from using reflectors and an assistant – if possible. Never change a winning team! If you’re looking for ideas for wedding photos and guarantee your guests a fun time, get a photo booth! As a wedding photographer it makes sense to have a photo booth as an option included in your packages, so you can offer it to the couple. Don’t forget to add appropriate props, such as sunglasses, hats or “team bride” signs to your proposal to provide even more unforgettable fun to the wedding guests.